MacRumors has learned that Apple is piloting a program to tap into its vast number of retail store employees to help improve the company's new Maps app for iOS 6. Details on the initiative remain unclear, but multiple sources have indicated that participating stores will dedicate 40 hours of staff time per week, distributed among a number of employees, to manually examine Apple's mapping data in their areas and submit corrections and improvements. ifoAppleStore posted a Tweet a short time ago indicating that it too has received information on the effort. It is unknown exactly what procedures will be used to examine the data, whether it simply be side-by-side comparisons with Google Maps data or if more sophisticated efforts such as in-person verification will be used. One source has indicated that a team of ten employees would be participating in the program at one store, with one of those employees being designated a "subject matter expert" to oversee the team and receiving training on how the team will operate. Changes to maps will reportedly be submitted through a dedicated internal portal on Apple's systems. 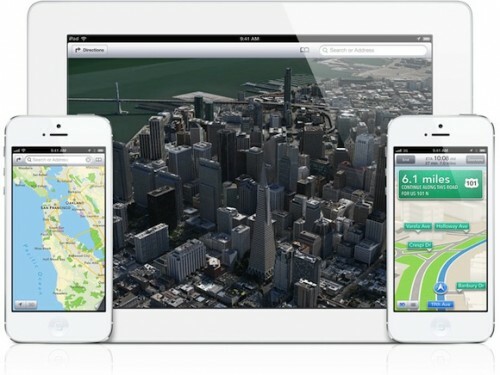 Apple's new Maps app for iOS 6 has received significant criticism since its launch, with Apple CEO Tim Cook finding it necessary to publish an open letter late last week to apologize for the app's shortcomings and to suggest alternative mapping solutions while Apple works to improve its own maps. Apple is reportedly aggressively hiring former Google Maps employees in its efforts to quickly improve its new mapping services, but much of the criticism has related to incorrect point-of-interest locations and other data best verified in the field or by those with intimate knowledge of a given area. Apple's network of nearly 400 retail stores represents nearly 40,000 employees scattered across more than a dozen countries, making it an ideal resource for assisting with mapping improvements. To the forum member who suggested this days ago and then was blasted for the idea, you were right. Not sure how I feel about this. Some of the store employees are clueless. "manually examine Apple's mapping data in their areas and submit corrections and improvements." So, the areas around Apple stores will be SUPER accurate, but Iowa... not so much. All the hipsters they pick will hide all their favorite hangout spots so no one can find them. yo! Apple. Why don't you stop being cheapos and spend some of that billions to actually hire thousands of people who's job is dedicating to fixing your maps. Get those people out on the streets, on foot, in cars, anything. That's how Google Maps got to the level of quality it is today. What's with the worrying? It's probably just "Go here. Look at our maps, verify location first-hand. Verify with Google Maps. Is the info correct?" True. When Google touts its huge team working on its own maps, do people assume they each have a Ph.D. in digital cartography? Many of them just need a drivers license. I visit quite a few forums and i'm a Moderator on a Football forum and I have to say this place is the most negative place on the internet.